After a delicious treat with Chocolates, I thought Kids would love another dose of tempting Street Food, this time all made at home. I know how much my daughter loves Pani Puri or when I got her to make Bhel Puri at home with me.There are so many other Street Food that comes in many forms and varieties. Of course there are the other Chat dishes that catch the little one's fancy. Imagine their pleasure when we make it at home and give them a treat! Indian Street Food are anything and everything that get offered right off the streets offered from the portable stalls. For more details on what all fall into this, read about the Indian Street Food. 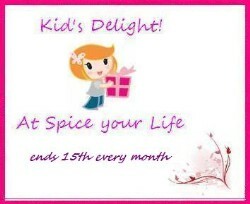 Please check out the rules and send in your entries either through the entry form or through email to spicingyourlife@gmail.com by 15th February 2011. I hope you will enjoy taking a walk down the lane with your wonderful dishes! The Chocolate Round up will be up soon. Thank you again for all those yummy entries.